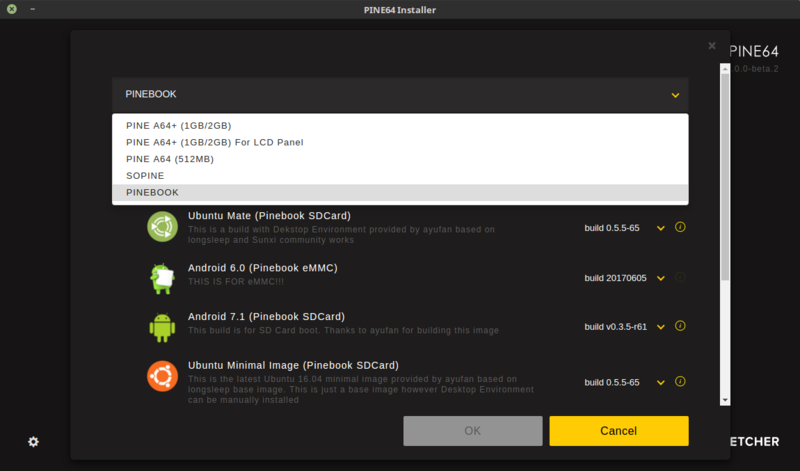 In order to flash a new image for the Pinebook to either eMMC or microSD please use the installer utility provided by Pine. The Installer utility supports all major platforms - Mac OSX; Linux; Windows 7/8.1/10, but CANNOT be run on the Pinebook itself if you wish to use it to prepare another SD card - you will need a standard x86/64bit machine to run this tool. Instert a MicroSD card to your computer and press Flash! The chosen OS will be downloaded, flashed and verified by the utility. After the process completed, remove your SD card and intert it into your Pinebook's MicroSD slot. If you chose a Pinebook eMMC Image, follow the onscreen instructions to flash your selection internal storage. If you opted for an image that boots from MicroSD, then your Pinebook should boot with the new OS straight away. If you wish to discuss flashing images and upgrading eMMC memory then please post in this thread under Hardware and Accessories.